It's hard sometimes to catch a thief on cameras that are out in the open, the thief will be able to see the camera and hid accordingly. 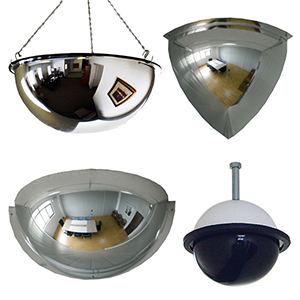 However, you can surprise the thieves with Security mirrors and domes placed strategically around your business. From security domes that can hid cameras to convex mirrors that can see around corners, stop organized retail crime before it happens. Don’t forget to contact a Product Expert if you have questions about these loss prevention items and more. You have probably seen black domes on the ceiling at the grocery store or other retail shops, these black are known as Security Domes. Security Domes are placed on the ceiling allow you 360-degree view of your sales floor, stock room or any other room you deem necessary. Security Domes come different sizes, including mini and standard. There are special Security Domes that look like the other ones but can not hold a CCTV Camera--these Security Domes are called Dummy Domes—Dummy Domes look identical to the Standard Security Dome, there is no way of telling the difference once placed on the ceiling. Whether choosing the Security Dome or the Dummy Dome you can always call a Product Expert to get more information about Security Domes and other Loss Prevention items.